Glenarigolach meaning ‘ glen of the forked shieling ‘ is accessed by a stalkers path leading up the hill on the E side of the Gruinard river. The area is centred on NG 98237 89963 and lies at a height of 100m. 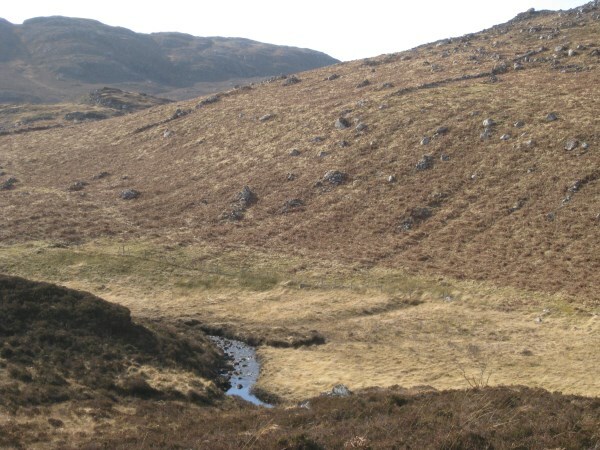 The glen was once well populated and Glenarigolach lies between the smaller settlements of Ridorcha and Craigour (See HER Record). 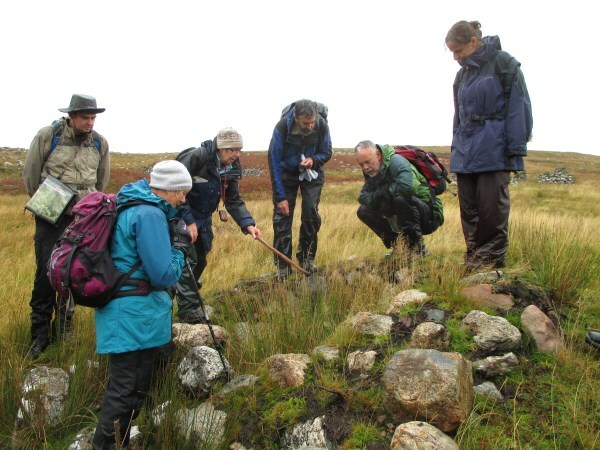 During the Highland Archaeology Festival 2014 NOSAS led a walk to the site on their second visit to the area. 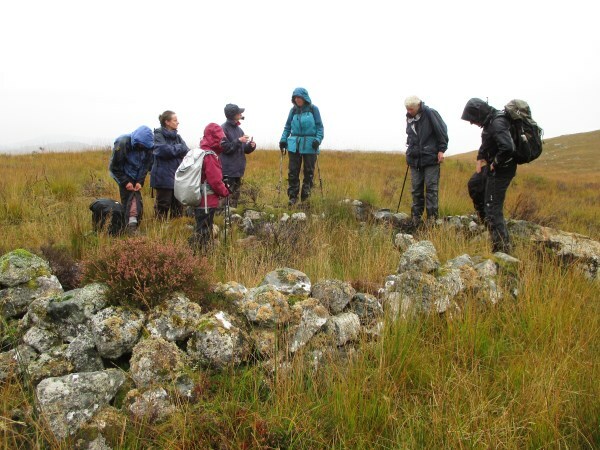 We were not quite so lucky with the weather as in April, but still enjoyed exploring the ruins and features, although some were submerged in bracken (see also our earlier post on the nearby settlement of Keppoch, which was recorded in April 2014). There is little documented detailed history on the area, but Meryl Marshall (NOSAS) is on the case so all will eventually be revealed! 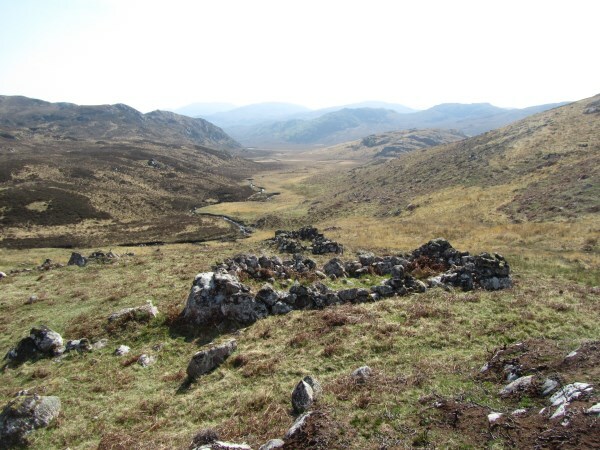 She has found that Glenarigolach is marked on the Pont 4 map 1583–96 as Ary Gaulach. We do know that the glen was cleared for a sheep run around 1840. Jim Buchanan has mapped the visible walls in the area using aerial photographs, and a walkover survey with Anne and Terry Doe has so far listed 33 buildings and features. 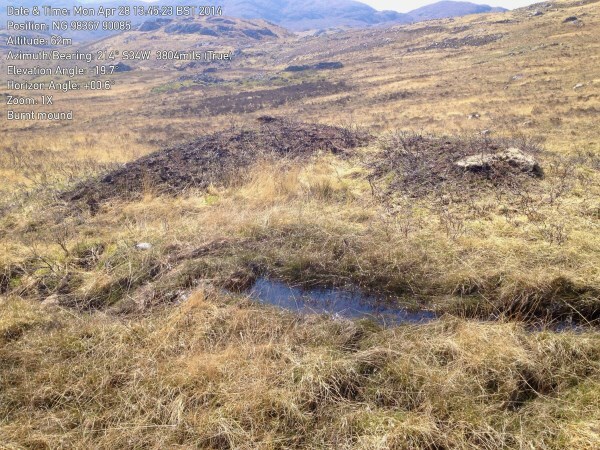 An extensive muir burn in 2013 has revealed more walls and field boundaries and a roundhouse, so further surveying will hopefully take place in early 2015 before everything is once again submerged in grass and bracken. We have established that this is a multiperiod settlement site. 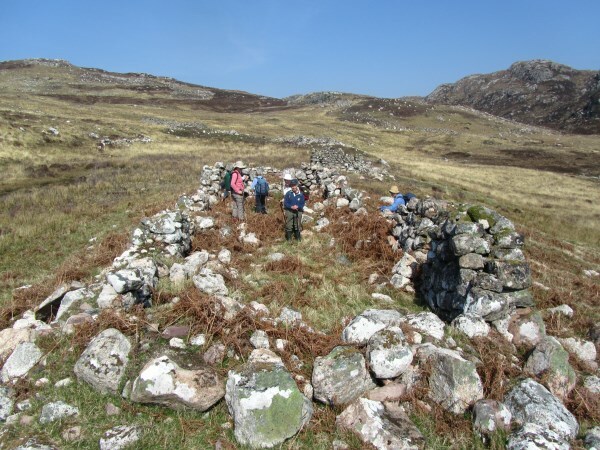 There is a 9m diameter roundhouse with associated field wall and possible burial cairnfield with at least 5 cairns. A classic horse shoe shaped burnt mound lies beside a small burn. There are 5 large enclosures with turf and stone walls, plus numerous smaller enclosures, extensive lazy beds, stone clearance piles, lynchets and lots and lots of walls! 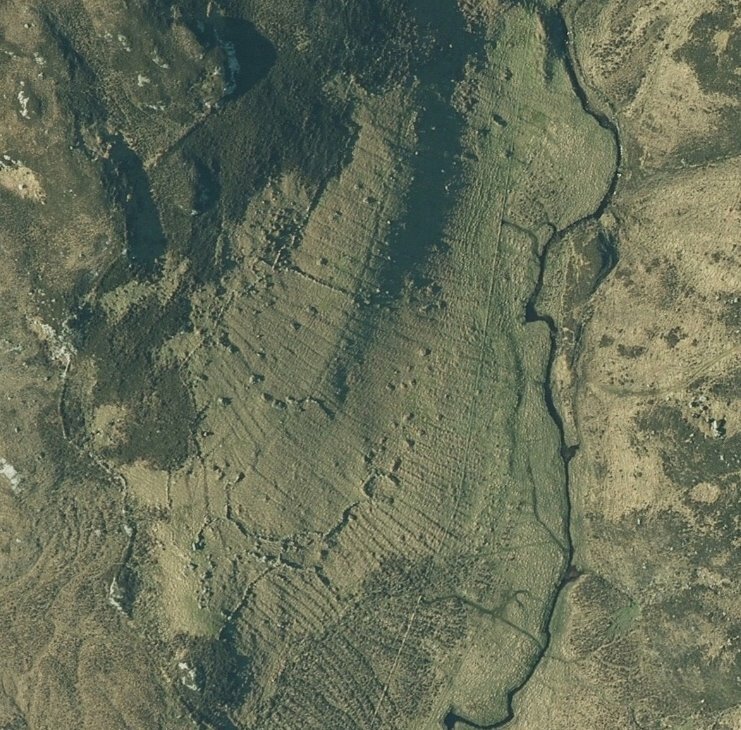 The footings of 13 small shielings/buildings lie on the slopes around the main township which is built on the top of a group of knolls above the boggier moorland. 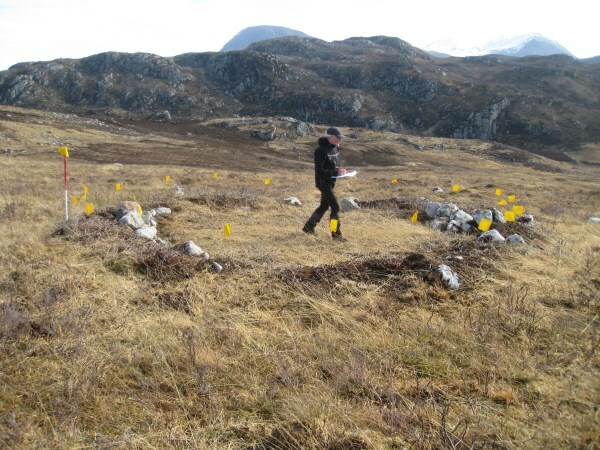 Top left: Surveying the roundhouse; Top Right: Possible burial cairns; Bottom Left: Burnt Mound; Bottom right: Lazy beds and clearance cairns. The later township consists of a row of buildings with terraces built out from them downslope. The walls are still upstanding to a maximum height of 2m. These are substantial buildings and some have what look like gargantuan byre drains! Are these for huge cattle or modified for some other purpose? Associated with the township are potato pits, a corn drying kiln, and a still tucked in behind another knoll up slope and out of sight. In the middle of the township is a more modern circular sheep pen with the stone taken from nearby robbed out buildings. Top left: Looking at the still; Top Right: Main township; Bottom Left: One of the byre drains; Bottom right: Explaining the workings of the kiln. 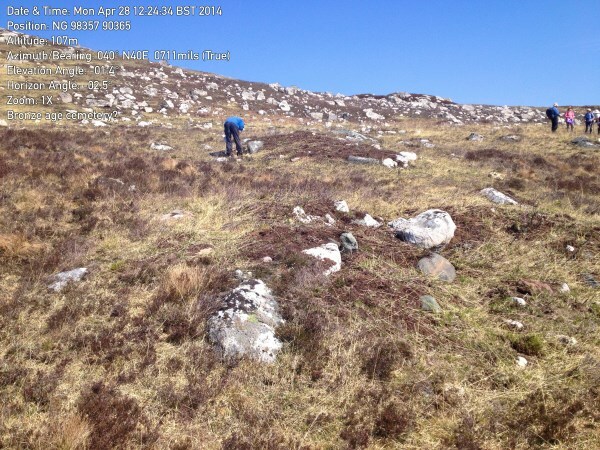 There is more to be done; walls to be surveyed, and a decision taken about more detailed surveys of the buildings. A feature that Anne Coombs has found needs to be investigated, and no doubt there are more to be found. A fascinating fairly remote site. If you would like to help with further surveying do please get in touch with either Meryl Mershall, Anne Coombs or Ann MacInnes through NOSAS. 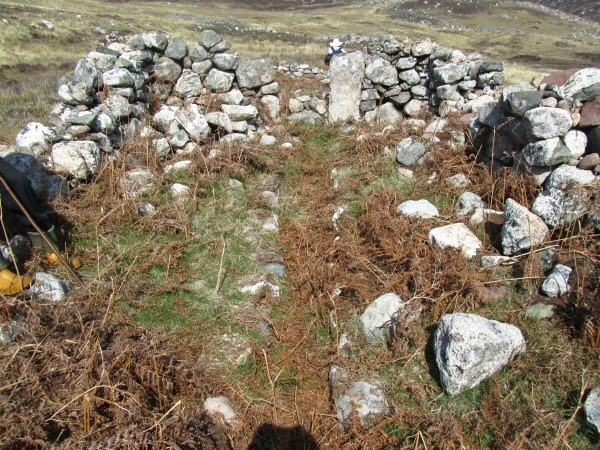 This entry was posted in General Archaeology, Post Medieval, Surveying and Recording, Wester Ross and tagged archaeology Wester Ross, byre drains, cleared village, corn drying kiln, Dundonnell, glenarigolach, Gruinard river, highland archaeology, Highland clearances, illicit still, Keppoch, lazy beds, lynchetts, North of Scotland Archaeological Society, NOSAS, pont map, Post Medieval archaeology, recording a building, recording and surveying, shielings, surveying a village on November 15, 2014 by nosas.